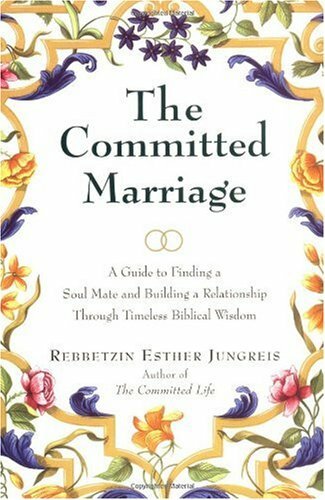 Expert Review of The Committed Marriage: A Guide to Finding a Soul Mate and Building a Relationship Through Timeless by Esther Jungreis, one of our picks of the top Jewish books for kids! Determined to provide sound advice and encouragement for any marriage on the rocks, as well as for singles and couples who have not yet experienced the challenges of living together, Rebbetzin Jungreis depicts the problems people face and offers guidance for getting through them. Those accustomed to the "disposable" life-who get rid of any hindrance to what is perceived as happiness-will find that this Torah-based relationship manual is hardly for them. The Rebbetzin (Hebrew feminine form of rabbi) shares her own matrimonial stories, which exude confidence that one can lead a life of peace and fulfillment, as long as understanding, giving, compromise and hard work are fully integrated into one's marriage. "Marriage is not a business partnership, it's not even give-and-take, but it's give and give more. Giving is a prerequisite to genuine love, although people mistakenly believe that just the opposite is true." Jungreis speaks with the authority of a psychologist and marriage counselor, the wisdom of a biblical scholar and the compassion of a wife and mother. She offers much of the advice already proffered by other relationship experts, but her inclusion of God and religion makes these stories and recommendations unique. She claims firsthand involvement in all of her vignettes, and since they all end successfully – a divorce called off, a lifetime dispute settled – it seems prudent to call on the Rebbetzin should trouble arise.